David Kenneth McLellan - Edmonton's Burial & Cremation Professionals | Trinity Funeral Home Ltd. It is with the deepest sadness to announce the passing of a much loved Son, Father, Grandfather, Brother and Friend after a valiant fight following Double Lung Transplant surgery. He left behind to cherish his memory his Parents Kenneth and Mary Mclellan, two daughters Christine McLellan, and Karen (Jay) Cunningham, Grandchildren Adrian Knull, Emma and Jenna Cunningham, Brother Darren (Fiona) Mclellan, and Sisters Debra Jackson, Deanna Amirault and Donna McLellan. David will be also be greatly missed by his nieces and nephews, Aunts, Uncles and long time friends and co workers. 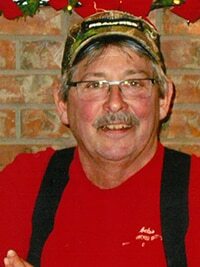 Spent many hours together enjoying the outdoors, camping, fishing, shooting, as well as get together’s with his family on many Saturday evenings. Dave enjoyed life and will be missed by Madeleine, myself and family. Rest in Peace dear friend. Will greatly miss a fellow hunter and artist in making knives. That hobby really demonstrated his exceptional talent in metallurgy! Spent many an hour talking fishing and hunting and will miss those visits when I would go to Edmonton. Dave will be greatly missed. We cherish many great times together: bird & big game hunting, ice fishing, salmon fishing, camping & quadding. He was “always there” to lend a hand as a friend and a co-worker. Dave you will be missed as a neighbor and a friend rest in peace.